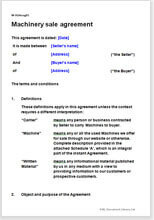 Use this template as a terms and conditions document when selling used machines of any type, kind, size or value. Signing in the form of an Agreement confirms acceptance (of the terms) by the parties and carries legal significance. The format is fit to be used to address peculiar situations where mostly commercial use machineries are sold by parties dealing in such machines on a regular basis. The buyer may be a user or a re-seller. The seller may be a re-seller or the original owner. There are no specific legal provisions that govern a legal document of this nature; you still have the liberty to make alterations and additions that exactly suit your situation or the case. With very small changes the document can be altered to use in completely different circumstances even in jurisdictions outside India. Any business or individual – holding clear title of a used machine which has outlived its utility for the owner, however, may be highly useful for someone else. The document also holds good use for the parties who are engaged in the business of buying and re-selling used machines. Detailed explanatory notes that help appropriate use and execution. Practical terms that protect parties from future disputes.